Risks and issue can be assigned to different tasks and resources or be global. For example, you could assign the risk “Budgetary problem” to all tasks that this risk could affect. 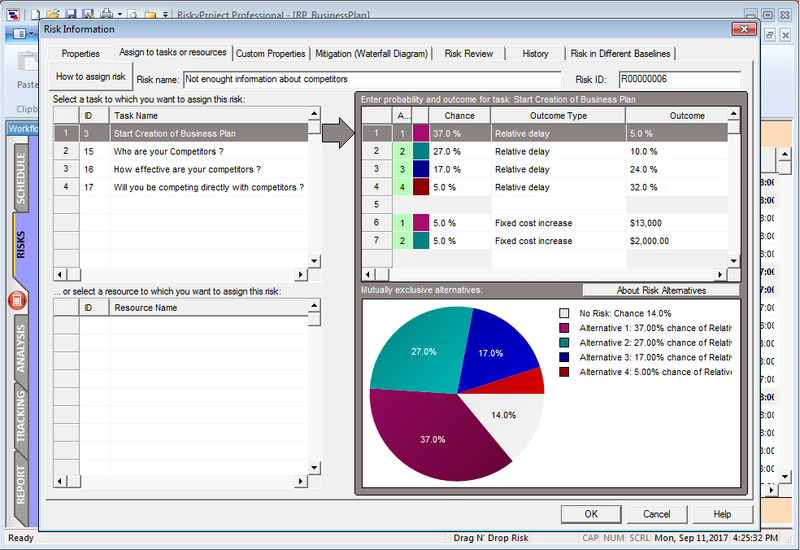 When RiskyProject calculates probability and impact of the risks, it analyzes all risk assignment. Each risk assignment will have different probabilities and outcomes. For example, “Budgetary problems” assigned to task “Project elaboration” will have chance of occurrence 30% and outcome “Restart task”. “Budgetary problems” assigned to task “Project transition” will have chance of occurrence 40% and outcome “Cancel task” .